What a place! What a route! It's easy to see how the early Mormon settlers found biblical inspirations in the place. The Zion Traverse is now a fairly well known 48 mile route that connects the East and West Rim Trails of Zion National Park. The Fastest Known Time (FKT) is currently held by Mike Foote and Justin Yates in a time of 7 hours and 22 minutes- quick! We however were not planning to make an attempt at the FKT, but rather enjoy a long adventure and get a great training run in. I never had any real time goals, but I figured 10 hours or so would be reasonable and would put us back to camp in time to drink beers in the river. Gabe and I started from the East Entrance trailhead at about 6:20 am, and the ladies started at the Lee Pass trail head on the West Rim trail around 6:45 (I believe). The only support we planned to receive from Gabe's parents was roughly in the middle by the Lava Point campground, which was roughly mile 28 for us and 22 for the ladies (we opted to do a short stem and go out to Angel's Landing, making the day just about 50 miles), so we were carrying a pretty good amount of weight in food and water for much of the run. 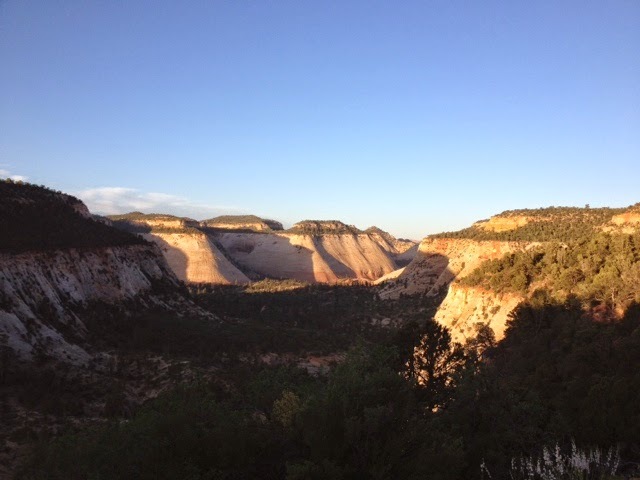 Gabe and I had a great early morning run, reaching the East Rim of Zion Canyon not long after sunrise- just spectacular. The descent down from the rim to the Grottos was fun and fast, and we stopped to take in some cool sections of trail through the slot canyons on the way down. Gabe's knee flared up a little bit and made us nervous part way down, but it seemed to sort itself out and we made good time to the bottom of the canyon. After a short section of road (around a mile) we arrived at the Grottos proper, greeted by the day's first wandering tourists. 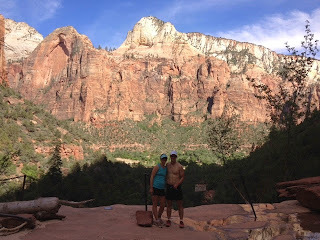 We refilled water there, took a bathroom detour, and ate a bit of food before starting the climb up toward Angel's Landing. 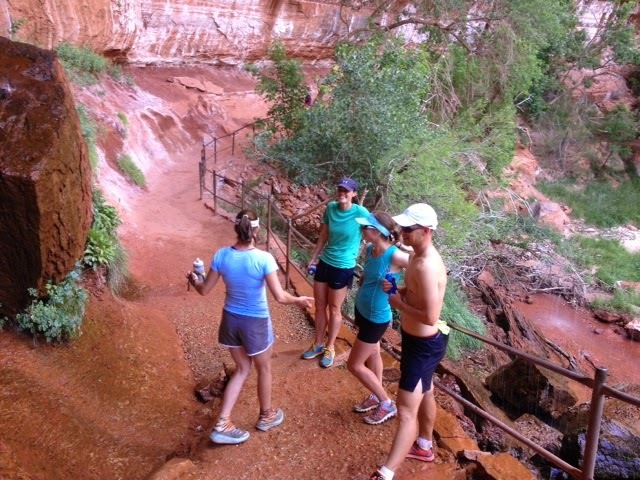 The climb up went pretty fast, chatting with one another and hikers on the way up, alternately hiking and running.We took the "detour" at the top to go out to Angel's Landing for a view. There was already quite a few tourists attempting the scramble, so we did a fair bit of dodging around them when possible, but otherwise waited our turn to pass certain sections. Most people saw that we were trying to move quickly and kindly offered to let us pass, but it still took us maybe 45 minutes round trip with a brief stop for photos and to take it all in. 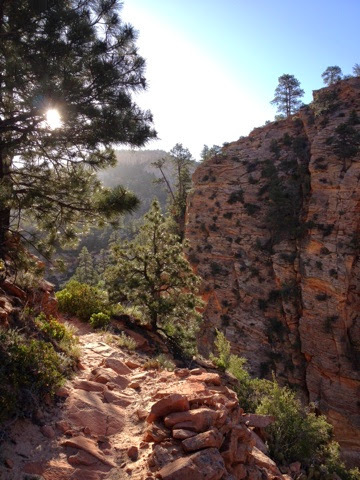 I had done it once before in a brief stop on a road trip through Zion, when I had gotten up around 5 am and ran from the Watchman Campground to Angel's Landing for a spectacular sunrise that I had essentially to myself. It's a great short hike, but I do wish that they hadn't installed all the chains and carved the various steps into the rock. The NPS has always seemed a bit confused to me with all its rules and restrictions on backcountry camping, permits, and off-trail wandering, but then it paves every path coming out of Zion Canyon with miles of concrete and installs intrusive, scarring permanent fixtures to enable more tourists to risk their lives for a better view. I know the agency has changed a lot since the establishment of these trails, but it is still a bit confused in my opinion. ANYWAY. Gabe and I made fair time running and powerhiking our way up toward the West Rim. 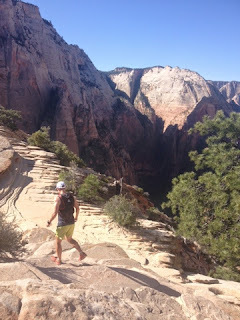 I felt like the pace we were moving at felt harder than it should at the time, but it was probably attributable to all the water I was carrying, roughly 2.5 liters from the Grottos. Gabe filled up his water from the tiny trickle that was the West Rim spring, but I still had enough that I felt okay skipping it to save time. 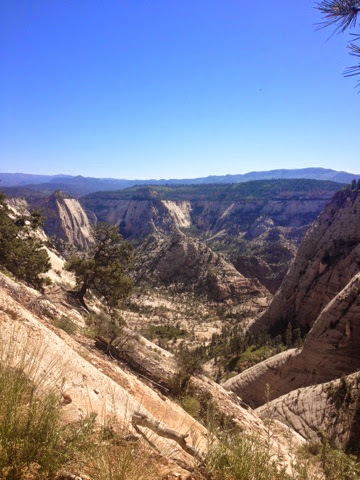 We finished the climb onto the plateau and headed out the West Rim Trail and were rewarded with some of the most spectacular views of the day, views that most park visitors never see. Way rad. 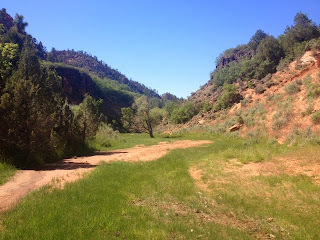 The next section of trail was relatively flat and fast, but we started to feel the heat around the Potato Hollow. We didn't stop at the spring there since we were moving well and it felt like we were pretty close to our "aid station," with the trail sign indicating it was 4 miles to the trail junction. Gabe's GPS watch died shortly after, and those 4 miles seemed more like 5 or 6. Could have been the sun and heat, but those were the longest four miles in memory. We were excited to round a corner and see Gabe's mom up ahead at a trail junction. She waved and started hiking up the trail, expressing that she thought the junction was confusing and didn't want us to miss it- mom's are great, aren't they?! The girls had beaten us there by about 15 minutes and were still hanging out when we got there- perfect timing! There was a short climb up to the parking lot and I was already feeling the heat quite a bit, so when I stopped at the car in the sun and the breeze stopped, the heat felt suddenly quite overwhelming, and I started to feel a bit dizzy for a moment. I went straight for a bit of shade under some shrubby trees and drank some cold water and felt better pretty quickly. This was a little alarming knowing that it was only going to get hotter as the day went on, but I focused on re-hydrating and refueling in the shade. Everyone was in great spirits, and it was fun to have little Ella cruising around, happy to see her parents. The girls took off maybe 10 minutes after we arrived, and Gabe and I accidentally hung out for much longer than we planned, maybe 40 more minutes? I think we both were subconsciously dreading the heat of the next 22 or so miles. But it was only 22 miles, right?! I think we left our little aid station around 1:40 pm. The next handful of miles went fairly quickly, though Gabe's stomach was acting up a bit, and I took a pretty good fall after kicking a rock mid-stride. 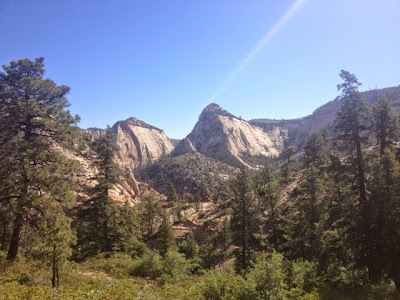 There were some really nice sections of shady trail running through Ponderosa Pine forest that gave us some reprieve from the unrelenting sun, and we stopped briefly to chat with a park ranger who was on a day hike. 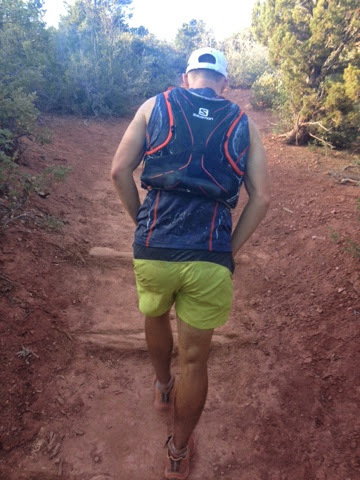 Not long after, Gabe stopped to take care of some business along the trail, hoping that it would ease some of the GI discomfort he was experiencing. We rolled the extended, mellow downhill and climb to the highway crossing. I had a good amount of water still, but Gabe had only brought bottles of an electrolyte drink that was no longer sitting well with him, so he was essentially out of fluids at that point. Crossing the plateau turned into a small personal hell for the both of us- the sun was brutal, the temperatures were the highest of the day, the trail was entirely composed of deep, loose sand, and Gabe was in a rough place battling diarrhea, nausea, and heat exhaustion. 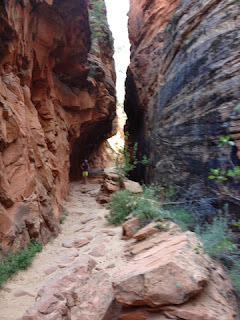 Physically, I felt fine, but this section of trail was very mentally-taxing. Part way across the plateau we ran into two ladies backpacking that expressed concern over two more in their party behind them. Gabe ended up being offered some water from a couple backpackers, which seemed to help his motivation a good bit. After what seemed like forever, we finally made our way down into the verdant Hop Valley and were very relieved to find a flowing stream just a little ways down the valley. We doused ourselves and refilled our water here (I just filled one bottle and treated it with a chlorine tab) and continued on down. Gabe's GI issues were escalating and he was obviously running with quite a bit of discomfort at this point, and we stopped a handful of times in shady spots to let him cool down a bit. When we finally made it down to La Verkin creek, I think we both would have been content to sit in that thing for forever. That beautiful stream supports a glorious oasis of big cottonwood trees and green grass in an otherwise very dry and imposing landscape. We doused again at the stream, Gabe got a little more water, and we started running again- only 6.5 miles to go. No problem, right?! 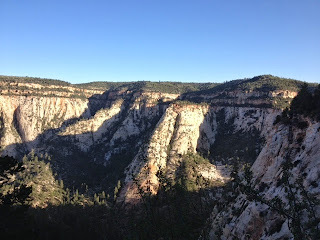 It felt like we made good time for a couple miles, running consistently if a little slowly, but Gabe seemed to start feeling worse as we turned away from the creek and started the last climb, exposed to the sun again. Gabe was obviously feeling pretty badly, and we ended up hiking the last 3 or 4 miles to the trailhead. 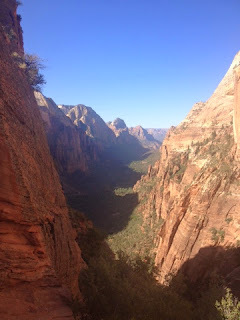 Amazingly, we ended up passing a hiker headed the opposite direction that we had talked with earlier in the day at Angel's Landing. He was excited to see us and asked us how the run had gone. Not wanting to stop, I quickly told him that it had gone well but that the heat had slowed us down a bit. I felt bad to not talk more, but was REALLY looking forward to finishing the day's effort. As we took the final steps up to the Lee Pass trailhead, Gabe immediately walked to the bushes at our side and vomited forcefully for a few minutes. Way to gut it out, Gabe! It was one of the most interesting and disgusting things I'd ever seen- black vomit! SUPERGROSS. After a few more minutes, we walked over to the truck and Gabe said that had been working its way up for miles, and he was feeling better already. We finished in something like 13 hours and 10 minutes. We decided I should drive in case he was going to be sick again, and we hopped in the truck and hit the road after getting some food and water for the drive. Some views shortly after leaving the "aid station"
The drive itself turned into a bit of an epic, with a few vomiting stops for Gabe, and a missed turn and some extra driving to get back to the campground. We had been hoping to find the ladies back at camp already, but Gabe's parents had met them at the Grottos and Jenny's knee was hurting her and Amber apparently had some pretty gnarly blisters on her feet, and they didn't arrive there until around 6:30 pm. 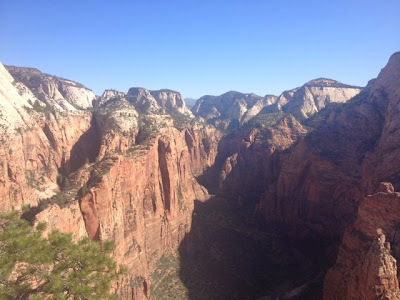 It seemed that they had slowed down a lot, or maybe Angel's Landing had taken them a fair bit of time, and with some rough math, it seemed like they might be finishing in the dark if they were moving slowly. 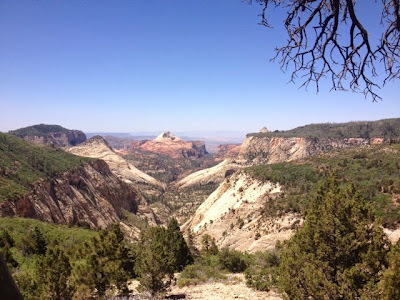 I was starting to scheme driving back to the East Rim trailhead to hike in with some jackets and headlamps when we pulled into the campground and night was settling in, but was relieved to get a text from Amber just minutes later saying they had made it back to the cars. Phew! I hadn't really been looking forward to moving more under my own power that night. Gabe was still having a hard time keeping any food or fluid inside of him, but when the ladies got back to the campground, we got busy making a righteous late dinner of brats, potatoes, and peppers over the campfire, and hit the hay shortly thereafter. We made a glorious breakfast the next morning consisting of many pounds of bacon, scrambled eggs, and hashbrowns, and everyone (slowly, painfully) packed up camp. Everyone actually felt relatively good, and Gabe was able to eat some real food after rehydrating a bit throughout the night. 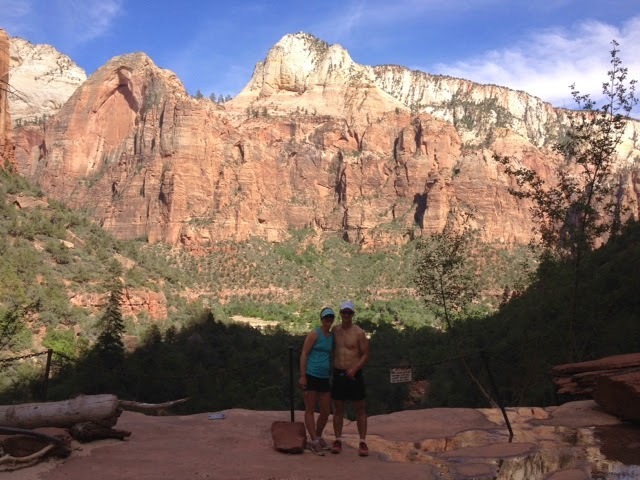 Amber and I lingered a bit longer and took the opportunity to soak and clean up a bit in the Virgin River before hitting the road for home. We got an early dinner in Provo, UT, briefly catching the rest of the crew there, and stopped in Park City for a walk around town to stretch out the legs a bit. We stayed in Green River with Amber's parents that night, and it felt great to relax, have a couple beers, and share stories of the adventure. We hit the road at 5:30 am the next morning, and Amber and I were both back to work just 2.5 hours later. The whole trip still feels a little unreal! Gabe and Jenny both put in some heroic efforts in the face of some very real adversity, and we had a great adventure along the way. That is success in my books. I've run a handful of days since then, and was relieved to feel pretty damn good overall. 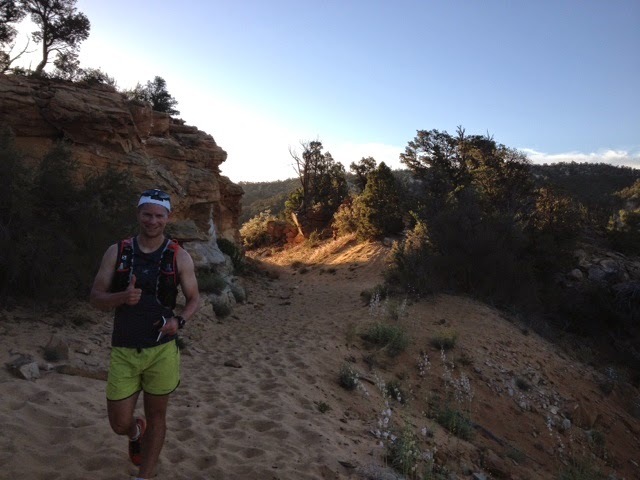 This is essentially my last big training week before my first 100 mile race on June 20th, the Bighorn 100. Anticipation, excitement, and anxiety are building. I was happy to come out of the Zion Traverse feeling optimistic rather than intimidated by the idea of a 100 mile race. As my first 100, it will be a big experiment, and I'm just hoping to have my own best day possible there- we'll see what that means on June 20th!